Like our primate forebears, we humans have long organised ourselves into social groups and it is only natural that we form teams at work too. Trust, a common purpose, shared culture and social norms are likely to develop within the family, tribe, group or team, along with a sense of identity that defines who is an insider and who is not. As organisations grow so do teams. The work of Robin Dunbar, an evolutionary psychologist and anthropologist suggests trouble starts as group size extends beyond about 150. As teams grow and multiply, so do team identities and purposes. Those in one team can easily come to see those in another as outsiders and rivals. Cooperation becomes more difficult as their interests increasingly conflict. When we examine the entrails of crises, persistently asking the question “why?” we often find that the root causes were well known at mid-levels of the company. Sometimes the actual crisis was predictable, even predicted, from what one individual knew – but for a variety of reasons no message arrived in the consciousness of someone sufficiently senior to take action. Frequently, key information known at mid-levels was spread among individuals who did not share it - so the information was never joined up. We have dubbed this the 'Unknown Knowns' problem. We analyse causes of failure such as these by reference to factors such as culture, incentives, structural silos and the resulting non-communication of information. Risk, psychology and sociology inform the analysis, but we have long suspected that anthropologists could enrich the analytical framework – if only they were interested in the business world. As a postgraduate level anthropologist turned FT journalist, some of Gillian Tett’s most perceptive writing has taken an anthropological look at business life. 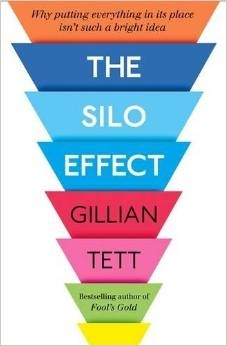 Her latest book, ‘The Silo Effect’, explicitly brings her anthropological training to bear on it. As you would expect of an experienced journalist, it is engagingly written. These mental maps are partly recognised by group members but some parts are subliminal whilst others are ignored because they are thought “dull, taboo, obvious or impolite”, leaving some subjects beyond discussion. These three explain much about how silos work and provide a useful additional perspective. They also imply an important corollary: it is in practice impossible for an insider to gain a reliable view of the world in which insiders live. Only an outsider can achieve the necessary detachment to see ‘inside’ life as it truly is. But the outsider typically lacks crucial information that is available to an insider. Tett describes how anthropologists attempt to become ‘insider-outsiders’ with access to inside information whilst retaining the relative objectivity of the outsider. It is no accident that our methodology has much in common with what she describes. We face the same challenges: except that we also aim to help insiders to understand what outsiders can see when given access to insiders’ knowledge. The balance of the book consists of case studies, written in Tett’s usual lucid style. Two of her studies of failure are built on her extensive knowledge of the financial crash of Noughties. She dissects how UBS, the Bank of England and the host of financial market regulators, experts and economists managed not to see the crash coming. A third tells how Sony, then a world-leader, reorganised itself into a series of separate business units, each with its own objectives. By creating what became silos, Sony lost internal cooperation and its way. Tett tentatively develops her theme to suggest an anthropological approach to mastering silos, from the outside as well as from within. She begins by describing how, with advice from Robin Dunbar, Facebook has set out to build structural bridges of friendship and trust between what might become silos; and a culture that encourages experiments and cooperation across what might be frontiers in a culture that treats mistakes as opportunities to learn. Tett’s second, contrasting tale tackles breaking down long-established silos. Her story concerns one of the most tribally structured professions: medicine. Structured around disciplines, there is a wasteful temptation for every doctor to try to apply their particular skill to your symptoms rather than beginning with an objective diagnosis and only then prescribing treatment perhaps by another doctor. Tett tells how a perceptive question led Toby Cosgrove, CEO of Ohio’s Cleveland Clinic to question and dismantle the Clinic's disciplinary silos to deliver care centred on the patient’s need for a dispassionate diagnosis before prescribing the most appropriate treatment. But for me, Tett’s third tale was the most telling. She relates how a detached but interested outsider, a hedge fund, was able to deduce that JP Morgan’s Chief Investment Office was placing huge bets on credit derivatives – at a time when JP Morgan’s leaders and risk team were completely ignorant of what was going on under their noses, let alone the scale. The hedge fund, BlueMountain, profited from the insight when the London Whale breached. The episode cost JP Morgan more than $6 billion in losses on a series of holdings with a value Tett estimates at approaching $160 billion. This story resonates with our experience. We regularly find that external analysis can identify organisations that seem blithely to be living on the edge of a cliff. As with real cliffs, it is rarely possible to predict when they will fail. But it is possible to predict why and with what consequences they will fail. Leaders who seek what can be an uncomfortable foresight will usually have time to deal with the issues and avoid disgrace since consequences usually take time to emerge. Astute long term investors can use such insights to avoid or improve vulnerable investments. And in those rare cases where the timing seems imminent, there may be opportunities to profit from another’s risk blindness.